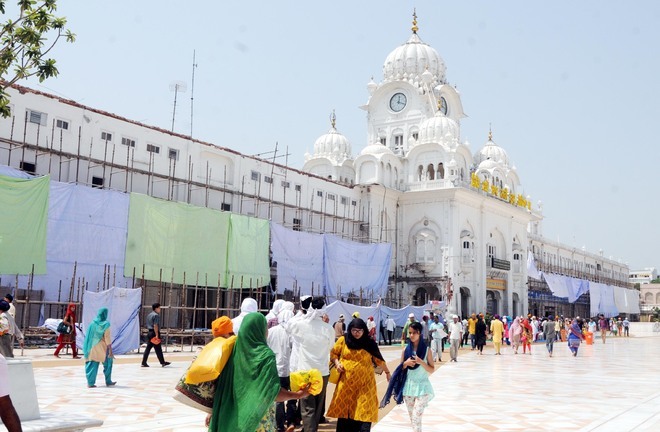 The state government is all set to further change the look of the main entrance to the Golden Temple in sync with the design of its ambitious project Golden Temple Entrance Plaza. For this, the government has evacuated the shopkeepers who were running their business on items like ‘kara’, ‘kangha’, ‘kirpan’ and religious books on either side of the shrine’s main entrance for decades. All these shops will soon be vacated. They have now been provided alternative shops right in front of their current location. As per the plan, the government intends to put up transparent glass in the verandah carved out after vacating these shops so that the pilgrims get a full view of it from outside. The residential accommodation atop these shops is also being vacated. At present, head granthi, additional granthi and other staff of the Golden Temple are residing there. The entire area, once vacated, will be given a new look for which a Ludhiana-based company has been roped in. According to sources, the area will have a façade made of sandstone grills which have been extensively used in the plaza project. The entire area will then have uniformity in its look. SGPC additional secretary Diljeet Singh Bedi said that the plan also includes expansion of the Central Sikh Museum and the information office. He said a part of the museum would be brought downstairs. Right now, the entire museum is located on the first floor which is approachable through narrow stairs. The museum will also be modernised. Spread over an area measuring 8,250 sq m, the sprawling plaza was thrown open by the state government on Diwali last year. In the second phase of the plaza, a number of facilities are to come up in the basement. Among the underground facilities are a state-of-the-art interpretation and information centre for tourists, VIP lounge, bank, ATM, airlines and railway inquiry, a multipurpose hall, security and services area, toilets and other public conveniences. As there is a lot of VVIP movement at the Golden Temple, the plaza will have a separate lounge to accommodate dignitaries and their entourage. An auditorium with a seating capacity of 100-150 persons will be built so that a visiting dignitary could address the media. At present, there is no proper place in the Golden Temple Complex where mediapersons can interact with the VIPs. The holy shrine is visited by thousands of devotees from across the globe everyday and their number crosses the one lakh on special occasions like ‘gurpurb’.